Even as SUVs and crossovers are taking a bite out of sedan sales, the Toyota Camry still managed to be the best-selling vehicle in 2016 without a truck bed. Impressive, given that it was in the seventh and final year of its current design. And doubly so considering that it was design that was never exactly at the forefront of style, innovation or, critically, the midsize sedan pack. Imagine, then, what the all-new 2018 Toyota Camry unveiled here in Detroit may be able to accomplish. It represents a fundamental shift for the Camry, from its obviously bolder styling and its reimagined dimensions, to the way Toyota says it will be more involving behind the wheel. It is 0.7 of an inch wider, the wheelbase is 2 inches longer, the roof and hood height have been lowered by 1 and 1.6 inches, respectively, and the front and rear hip points have been lowered by a similar amount. The result of those dimensional changes should be a feeling of sitting in the Camry rather than on it. The steering wheel also now telescopes further (applause from the tall folks in the back), and the hood, cowl and dashboard have all been lowered to maintain visibility.To further bolster those improved dynamics, Toyota stiffened the Camry – something it had already done considerably during the previous generation’s substantial mid-cycle refresh for 2015. There’s also a new double-wishbone suspension and four-point engine mounts for a reduction in noise, vibration and harshness (good news for those traditional Camryists out there). According to Toyota, driving dynamics were so at the forefront of the new Camry’s development that “drivers will notice the dramatic improvements within the first few seconds of driving.” We’ll just go ahead and consider that a challenge for our inevitable first drive. The all-new 2018 Camry comes with an equally all-new lineup of powertrains. The vast majority of those you’ll see lining the Safeway parking lot will come with a new 2.5-liter naturally aspirated four-cylinder “Dynamic Force Engine.” Rather than going the small-displacement turbocharged route, Toyota adopted a longer stroke and higher compression ratio, direct injection, a variable cooling system, and the latest iteration of the brand’s Variable Valve-Timing-intelligent Electric (VVT-iE) system. Output specs weren’t released, but Toyota promises better power and torque (the current 2.5-liter produces 178 horsepower and 170 pound-feet of torque) along with best-in-class fuel economy. The current leaders in the clubhouse manage 31 mpg combined. Also new is the 3.5-liter V6, presumably shared with the 2017 Toyota Highlander and Sienna. Both four- and six-cylinder engine options are paired to a new eight-speed automatic transmission. 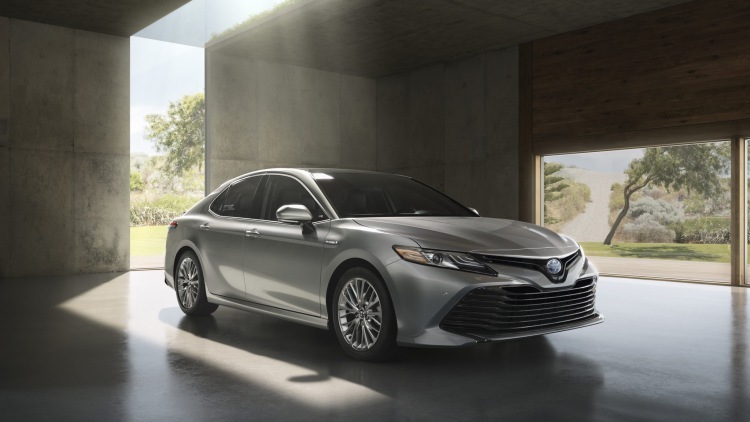 The Camry Hybrid makes its return also featuring the new 2.5-liter four-cylinder along with a revised continuously variable transmission that features a new Sport mode capable of simulating six gears. Selecting Sport mode also increases electric boost and thus acceleration. One key change to the Hybrid is that its battery pack was relocated from the trunk to underneath the rear seat. This should theoretically improve trunk space and improve driving dynamics by relocating the batteries’ ample weight toward the vehicle’s center of gravity. Toyota anticipates the Camry will achieve “Prius-like city/highway” fuel economy, which would put it in the ballpark of 54 mpg city and 50 mpg highway.Toyota promises a more driver-focused cabin design to go along with the aforementioned altered seating positions. The interior can be equipped with Toyota’s new “Human Machine Interface” that consists of a 7-inch gauge display, a 10-inch color Head-Up Display and center stack controls that feature the latest Entune 3.0 touchscreen integrated with the HVAC control panel. Entune has been updated with new, more smartphone-like menus and icons, along with a basic navigation app standard. On-board WiFi is also now optional and the available JBL sound system has been upgraded. All of the 2018 Camry trim levels (which continue to be split between the comfier LE and XLE, and the sportier SE and XSE) come standard with the Toyota Safety Sense suite of accident avoidance technologies. These include forward collision warning with auto-brake and pedestrian detection, lane-departure warning and auto-steering, adaptive cruise control and automatic high beams. The 2018 Toyota Camry arrives in dealers late summer 2017.